Dr. Clarence Hiura was honored with the President’s Award for Lifetime Achievement by the California Pharmacists Association at a ceremony in Monterey on March 17. 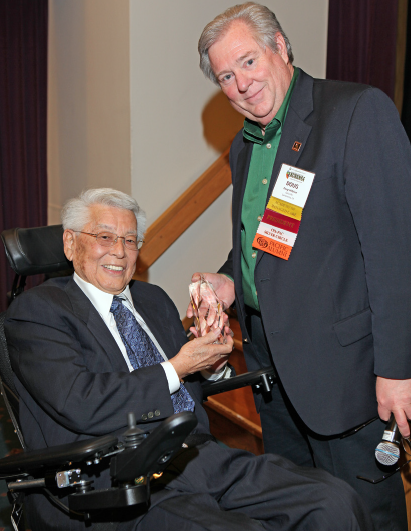 Dr. Clarence Hiura receives a lifetime achievement award from Doug Hillblom of the California Pharmacists Association. Hiura has served as a pharmacist for over 50 years — his license was issued in 1958 — and has been involved in creating many legislative regulations in the pharmacy industry. Before a standing ovation from over 200 people, Hiura was also presented with a resolution by the California State Legislature, setting forth his years of dedicated service to the California State Board of Pharmacy and California Pharmacists Association. The resolution detailed Hiura’s professional achievements, which include serving on the boards of East Los Angeles Pharmacists Association and United Pharmacists Network Inc., as president of Nikkei Pharmacies Inc., as clinical associate instructor at University of Southern California School of Pharmacy, and as a member of the California Department of Consumer Affairs’ Board of Pharmacy, as well as his personal accomplishments, including 53 years of marriage to his wife Grace and being a father to four children and grandfather to nine grandchildren. The award presentation came at a particularly special time as Hiura continues his fight with cancer. Consistent with his character and devotion to his profession, he focused the attention away from himself and challenged the younger-generation pharmacists to carry on the traditions he helped establish in the industry. His message was to focus on patient care needs and make pharmacy the most respected health-care profession.